Great crested flycatchers are the only Cavity Nesting member of the flycatchers found in the eastern part of the United States. They winter in Central and South America. They spend most of their time hunting in the tree tops. The cup of their nest is not located in the center of the nesting material but in the back away from the entrance. My guess is this makes the nest safer from predators. If you want to provide nesting for Great Crested Flycatcher and you have House Sparrow & Starlings, you will have to practice European Starling Control and House Sparrow Control as both are a non native competitors to the great crested flycatcher. Putting up a nest box for great crested flycatchers may entice them to nest. But putting up a nest box will more than likely also attract both house sparrows and European starlings. Both are introduced invasive species. Before you decide to put up a nest box for great crested flycatchers, you must commit to preventing house sparrows and starlings from nesting in your nest box. They will destroy the eggs or nestlings of the flycatchers. If you are ready to control house sparrows and starlings, then you will need some nest boxes. After trying various sizes for a great crested flycatcher nest box, I've come up with an optimum size that is easy to build. It uses pine boards, which are smooth on all surfaces. The box uses a front opening design and allows for nest box traps to be inserted. I'd suggest building more than one nest box as the extra nest boxes can be used to trap the invasive house sparrows and starlings. 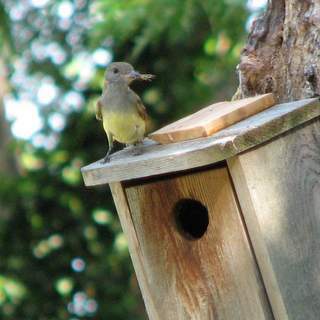 Great crested flycatchers prefer a nest box that is mounting at least 10' high in an open area near trees. The method of mounting your flycatcher box is as important as the design of the nest box. Mounting to a tree or wood post is not a good idea, as predators will be given easy access to the box. Furthermore a nest box mounted on a tree is difficult and dangerous to monitor. A much better technique is to mount the box on a telescoping pole mounting to a piece of rebar. This allows the box to be located anywhere you can drive a piece of rebar into the ground. 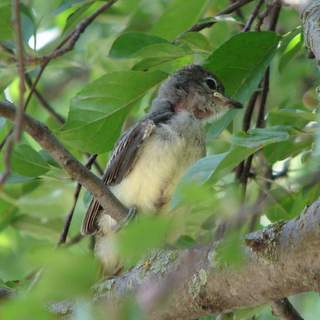 Both species will destroy the nests and nestlings of great crested flycatchers. I had house sparrows destroy a flycatcher nest and I've seen starlings try to steal a nest box from a pair of flycatchers. You must commit to trapping these species to prevent them from competing with great crested flycatchers. Never allow them to nest in your nest boxes. On May 29, I was leaving the house to run an errand. As I'm about to get in my truck, I notice a pair of great-crested flycatchers trying to get into a bluebird house that I mounted on a dead tree in my front yard. 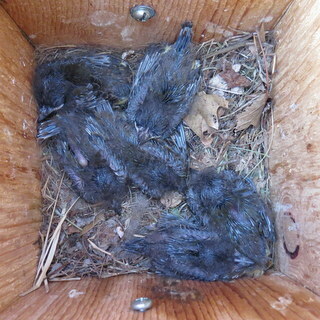 There was a problem - they were bigger than the nest box hole. On a whim, I took the house down, drilled a larger hole in the next box, and put it back up. I got in my truck and ran my errand. When I returned home, I found the female gathering nesting material in my driveway and was taking it to the nest box as the male kept guard. What a treat to have them nesting in my front yard. I could see them whenever I left the house. They didn't mind me sitting outside enjoying their daily activities. Because of their size, I decided to custom build a larger nest box for them for 2012. Its dimensions are 5 3/4" x 6 1/2" x 9 1/2". The hole opening is 2" in diameter. Jun 1: They have their first egg. This video shows the female building the nest. You can hear the male in the background. A week later, I found a male House Sparrow at the house. He had destroyed their eggs and they never renested. I was able to capture him using a Next Box Trap. In 2013 they nested in a new box I mounted on EMT conduit about 6 feet above the ground. It has a 2 inch diameter hole. The inside floor dimension is 6 X 6 inches with an inside height of 8 inches. In retrospect, this box is too shallow and was later replaced. May 15: I noticed the flycatchers at a new house I put up this spring. May 20: I noticed flycatchers near the house. I opened the nestbox to discover a nest composed mostly of grass clippings. I decided to observe and saw the female continue to bring nesting material to the house as the male stood guard over her. May 25: The first egg is laid. June 6: I removed the top of the nest box to photograph the eggs. The pair has four eggs. June 26: All of the chicks fledged. In 2014, the flycatchers used a box I mounted on a 10 foot telescoping pole in my garden. This is the same house I used to trap starlings in earlier in the year. Its interior dimensions are 5 1/2 inch square base and 12 inch height. The entrance hole is 2 inches in diameter, but a flicker enlarged it somewhat. The flicker nest box is located about 10 feet away which neither seem to mind. The flycatchers seem to prefer a nest box mounted at a 10 foot height. The nest box they used last year is only about 6 feet high and they ignored it this year. Learn more about Building & Mounting a Nest Box. May 18: I noticed a flycatcher carrying nesting material to the nest box. May 26: The first egg is laid. 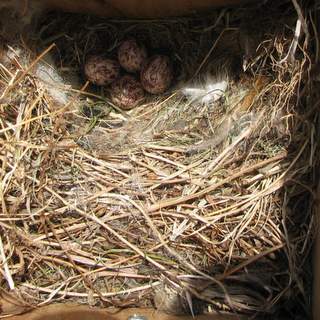 Jun 6: I checked the nest box contents and found six eggs. Last year they only laid four eggs. 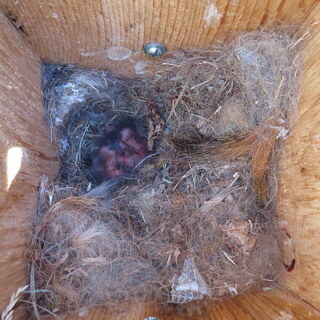 Jun 13: I opened the nest box and found 4 hatchlings. There was also one unhatched egg. It was hard to count them and they were so tiny. I will have to check later when the babies are bigger. There is squirrel hair as well as the bit of snake skin used in constructing the nest. Their nests are really an interesting collection of material. Jun 18: I thought I'd see how much the flycatcher babies had grown. Their size has increased dramatically in just 5 days. I was also surprised to count SIX mouths. All six eggs hatched. The babies all look to be about the same size. I'm sure glad I didn't toss out the unhatched eggs because they obviously hatched. Imagine the food it takes to feed six growing flycatchers. Flycatchers feed their young flying insects. Insects are dependent on native plants. Therefore it's important that native plants make up the landscape where the flycatchers breed. Jun 22: I checked on the progress of the babies. They are starting to get feathers. Jun 26: I checked on the babies and was pleasantly surprised to find that they were fully feathered. I expect that they will leave the nest in a day or two. Jun 27: The flycatcher babies leave the nest box. See the video. Watch as a young flycatcher leaves the nest box. In 2015 the flycatchers are nesting in the same box as last year. This box is located in the garden and is mounted 10 feet high on a telescoping pole. The box is located about 10 feet from the flicker nest box. May 16: I first notice a flycatcher inspecting nest boxes. A house wren attacks a flycatcher when it inspects the wren's nest box. May 29: After opening the nest box, I find the first egg of the season. June 4: The flycatchers now have 6 eggs. June 16: All of the eggs hatched. June 30: All of the babies fledged. In 2016, the flycatchers choose a different nest box that is located on the side of my house by the garage. This box has the same dimensions as last year's box. It is also located 10 feet high on a telescoping pole. 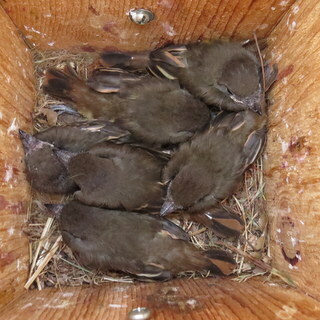 May 19: I accidentally catch a flycatcher in a nest box that I was using to trap starlings. I release him/her unharmed and remove the trap. This is a different nest box than they nested in the past two years. May 28: I see a flycatcher with nesting material on the same box. Later I see a flycatcher enter the nest box. Jun 3: The flycatchers lay their first egg. This is later than previous years. Jun 7: The clutch of eggs is complete. The flycatchers have 5 eggs. Jul 5: The nest box is empty. All five fledgling have left the nest. In 2017, the flycatchers used the same box as last year. May 15: There is a flycatcher repeatedly flying into my back window. I think he sees his reflection and is attacking it. May 16: I remove the nest box trap from the box that the flycatchers nested in last year. I've been catching starlings with the nest box trap as they are a constant threat to nesting flicker woodpeckers. Jun 16: The nest still has 6 eggs. Jun 18: All of the eggs in the nest are gone. I see one of the flycatchers. Something must have eaten the eggs. I put a nest box trap in the box and caught a red-bellied woodpecker. Is it possible that is who ate the eggs? The flycatchers did NOT renest in my yard. In 2018 they decided to nest in a box by my pond. This box has a 4" x 5.5" floor and is about 12" deep. It has a 2" round hole. I'm not surprised they chose a different box as last year's nest was predated. 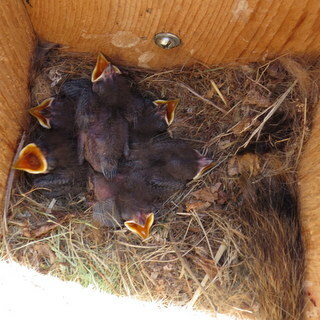 May 21: I notice the flycatchers beginning nest building in a nest box by my pond. They've never nested there before. This box is 4" x 5.5" and is about a foot deep. May 28: The first egg appears. Jun 1: There are five eggs in the nest. Jun 16: All five eggs hatched! Jun 27: It appears the nestlings are going to fledge. Jun 28: I open the box and it is empty. All five must have fledged!